Ryan Stevenson headed a late equaliser for 10-man Dumbarton to round off an eight-goal thriller against Ayr at Somerset Park. 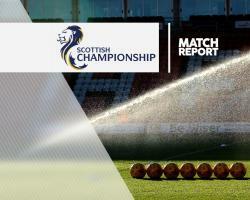 Scott McKenna and Gary Harkins gave the hosts a two-goal advantage before the break before strikes from Robert Thomson and Daniel Harvie drew Dumbarton level. Alan Forrest put Ayr back in front from the spot in the 74th minute after Sons defender Alan Stirling was sent off for a foul on Paul Cairney. In a dramatic final six minutes, Joe Thomson equalised for Dumbarton with a cross-shot only for Cairney to restore the hosts' advantage almost immediately from close range. But the visitors were not finished and they grabbed a point in the 88th minute when Stevenson headed home from close range following a corner.